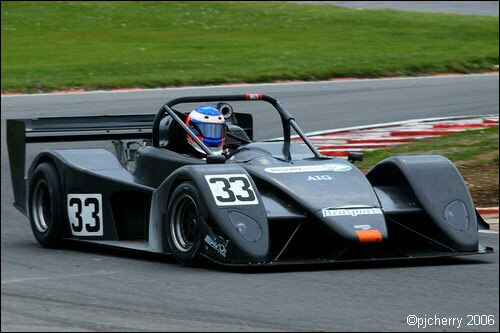 Old-hand Mike Roberts and his young sidekick Simon Parker claimed victory in both one-hour Britsports races last weekend, in Mike’s Juno Sports Prototype. 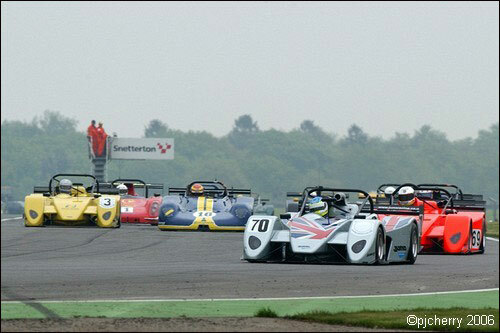 Ewan Baldry’s Juno works team was backing four cars at Snetterton, and the marque swamped the front end of the grid for Saturday’s Race 1, claiming five out of the top six positions. The Roberts / Parker car was on pole, at 1:04.033, with the dayglo orange SS3 of Jeff Davies and Neil Briggs over a second shy. The impressive Bicknell RE95 of Nick Pashley and Chris Ward was third, then came the older, privateer Juno SS2 of Rob Oldershaw and Andy Schulz. 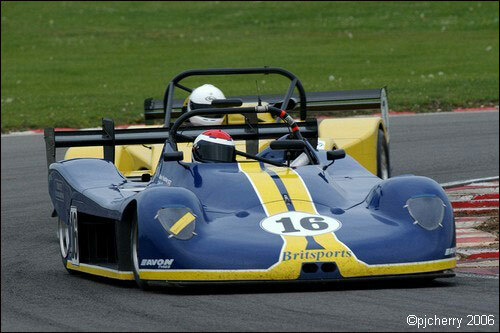 Dave Mountain and Clint Bardwell’s Juno SS3 was fifth, with the similar car of James Richardson sixth. 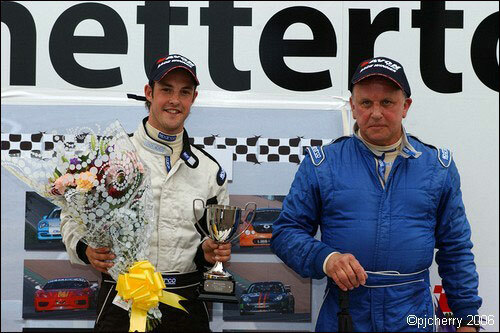 Simon Parker took the silver Juno into an immediate lead at the start, on the damp track, but Andy Shulz, in the Oldershaw car, came to grief at the Bombhole on lap two, bringing out the safety car. It was far too early for mandatory stops, of course, and when the caution was lifted, Parker streaked away once more, having a 14-second advantage after the first racing lap, over Richardson, who had Briggs on his tail. Tony Freeman, driving alone, was clambering through the field in his supercharged Radical Prosport, as was Doug Setters, in the Jade. With just over half an hour to go, most chose to make their mandatory pit-stops, Anthony Wilds being first, handing the Gunn TS7 to Mike Higson. Clint Bardwell took the yellow Juno over from Dave Mountain, but stalled, beginning a problem that would see the car eventually retire from the race. Similarly missing at the end would be the orange Juno, which Davies stayed in after the mandatory stop. No such woes for Mike Roberts, though, having taken the car over from Parker slightly later than most, he was responding to a late charge from Richardson. With just five minutes left to run, the safety car was deployed to assist the recovery of Higson’s Gunn, and let the field go again with less than one minute on the clock. Roberts took the flag with nearly six seconds advantage over the advancing Richardson, with the Pashley / Ward Bicknell third. Tony Freeman’s Radical had slowed dramatically in the closing stages, even under the safety car, and now spluttered across the line, out of fuel. So, was Mike Roberts aware of the closing Richardson? “My mirrors were bent, and I couldn’t see behind me,” he joked. The grid for Race two was set by the Race 1 result, and it was Richardson seizing the advantage this time round, with a fast-starting Briggs swiftly moving into second, leaving Roberts and Bardwell to squabble over third place. A puncture, and a spin at Russell, saw leader Richardson (below) pitting for attention, leaving Briggs in the lead. Once the half-time pit stops were taken, young Simon Parker blitzed through into the lead with 20 minutes to go, setting fastest lap in the process. Tony Freeman, Jay Wheals in the Speads, and Rachid Bouzouba (having his first run in a Global Lights) all posted retirements, whilst Richardson incurred a stop / go penalty for a pit lane infringement, as did the Mountain / Bardwell Juno (#3), after a lengthy repair to a buckled push rod. So, after 52 laps, it was the Roberts / Parker Juno winning again, with the Davies / Briggs SS3 second, and James Richardson’s sister car third. 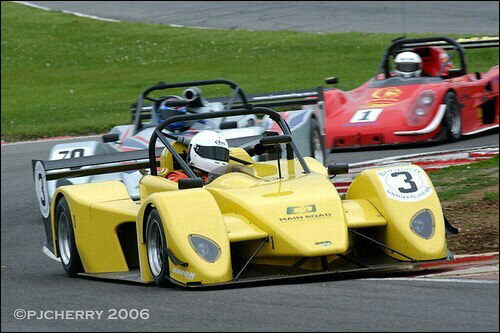 The Pashley / Ward Bicknell (above) coasted across the line for fourth, out of fuel, ahead of Ian Bankhurst’s Radical SR3. 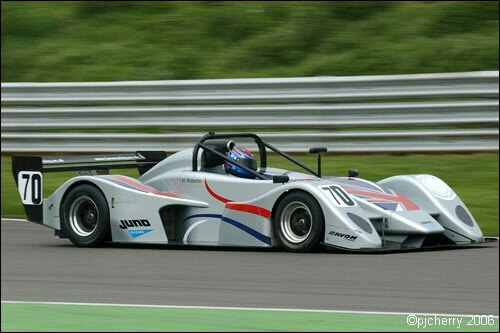 The Mountain / Bardwell Juno had done enough to be classified sixth, in front of William Curtis, who had acquitted himself well in his first ever race, driving a Prosport LM3000. Tony Gaston’s Radical was the last classified finisher in seventh.